It’s been tough for music fans in Sydney these past few years. We’ve seen the deaths of several large festivals, institutions like the Big Day Out and Stereosonic who delivered sick, international act chocked lineups to tens of thousands of people for years. We’ve struggled under the oppression of the lockout laws and unfair noise restrictions- it has all been a bit of a bummer. This may be why the inaugural Sydney City Limits festival, held in Centennial Park on a Saturday, was the highlight of the festival season. An offshoot of the iconic Austin City Limits festival over in the States, SCL came out guns blazing with a huge lineup, featuring both homegrown talent and an array of international artists- more than enough hype to compete with its boutique festival rivals. The sun was shining in the early afternoon when the day started to pick up. Being the last weekend of summer, Sydneysiders were rocking their best festie fashion (inc dancing shoes) and high spirits. The site filled fast with punters- a diverse crowd with everyone from seasoned festival vets in head to toe sequins to cute kids doing that insane Swish Swish dance while their parents cheered them on. Tkay Maidza, a last minute addition to the lineup due to Young Thug’s no-show (AGAIN!!! ), got things cooking on the Harbour stage with thumping beats and sick dance moves. She was followed by brit-rockers and noughties pop culture legends The Libertines– they pumped out hits ‘Don’t Look Back Into The Sun’ and ‘Can’t Stand Me Now’ to a crowd begging for more. Aussie festival staples Dune Rats and Gang Of Youths both drew enormous crowds, the latter putting on the epic kind of show fans have come to expect of them. Frontman Dave Le’aupepe is well known for his compelling on stage persona, and didn’t fail to bring the hip-gyrating realness while busting out ‘Magnolia’. The day pressed on, with crooner Vance Joy delivering a stellar set that included tracks from his new album Nation Of Two as well as a cheeky (and VERY well received) cover of Justin Bieber’s ‘Sorry’. Back on the Harbour stage, eager fans began to gather to catch Future, who soon appeared, launched into ‘Draco’ and promptly vanished for like, a really long time, presumably due to technical difficulties. I wondered if he’d gone to join Young Thug, wherever he was. Miraculously, Future soon rematerialized and blessed fans with a tight set as the sun went down including hits ‘Jumpman’ and ‘Mask Off’. It was worth leaving the craziness of the main stages to visit Jake & Kenny’s Food Fight, a mouth watering collection of some of the best eats Sydney has to offer. The Hibiscus and Lime Fresca from Bad Hombres hit all the right spots and was perfect to wash down The Lansdowne’s Shroom Pizza… And a Mary’s Burger… Don’t judge me. Triple J darling Tash Sultana unsurprisingly drew a huge crowd, her now legendary loops ringing loud through the Big Top stage as she tore through a vibe heavy set featuring her breakout hit ‘Jungle’ and newer release ‘Mystik’. Back at the House stage, Beck was busy just being Beck. His high energy show had everyone in sight dancing, the band was tight and his light show was magnificent. 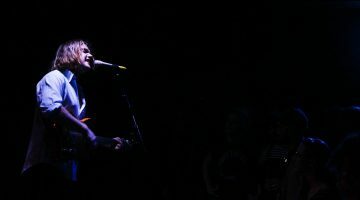 He tore through hits ‘Loser’, ‘Fake Love’ and ‘Up All Night’ with effortless skill, charming the audience and even breaking into a brief cover of Gary Numan’s ‘Cars’. Soon enough it was time for the French Invasion, as both Justice and Phoenix took to the stage. I was lucky enough to catch a little of Justice who were clearly taking no prisoners as they pounded ‘Genesis’ to a crowd who were gagging on the bass. From the second Phoenix took to the stage, they had fans enthralled- beautiful neon lights projected behind them supported their soaring synths and frontman Thomas Mars’ ever-youthful vocals as they ripped through hits like ‘If I Ever Feel Better’, ‘Lisztomania’ and tracks from their sickly sweet 2017 release Te Amo, including an instrumental version of the title track that was just effervescent. They closed out the night’s antics with ‘1901’, ending their set and the day at large on a very high note. If Sydney City Limits can come through with the goods next year, it will cement itself with ease into the zeitgeist of Australia’s many beloved festivals. SCL marked a return to the huge festivals Sydney has since mourned the absence of- a killer lineup, good vibes and a great venue made for one hell of a debut, and an incredible end to summer and festival season.